Can I rant for a sec? Then we’ll get back to the regularly scheduled program, I promise. Okay so yesterday I had briefly mentioned being an introvert, and immediately I thought of a post from Magnet For Foolishness that my friend shared with me a few weeks ago. If you’re reading this and you’re an introvert, I think that you will appreciate the things that the author, Sonya, brings to light. 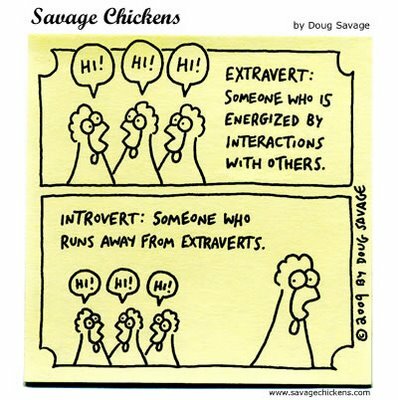 To piggyback off of her points, I do think that introversion is something that gets misunderstood time and time again, often being confused with shyness. And I think it’s worth bringing up because many, many artists are pegged with the stigma of being socially awkward, brooding, anti-social personalities when in a lot of cases that’s not the truth at all. I take great offense when people treat introversion like a behavioral or psychological disorder, and think that by pushing an introvert to be more outgoing is the way to “fix” them. Uh-huh, that’s nice and all…except that we actually don’t need to be fixed. It’s very insulting. I’ve dealt with that many times throughout my life, from family and friends alike. So Introverts, trust me, you are not alone! Mama knows. A shy person that’s afraid of people, is overly self-conscious, and insecure might need some outside help; but not an introverted person. An introvert is simply self-contained, self-satisfied, and independent. We are thinkers. We can still be just as confident and friendly as any extrovert, we just don’t need to prove it to everyone at every moment or outing. And there’s nothing wrong with that! We’re more likely to just respond to someone’s outreach than be the one always doing the outreaching, and 9 times out of 10 our response will be positive (unless we’re approached with condescension or rudeness, in which case you’re on your own after that. haha). This isn’t an attack on extroverts at all, I love all of ya’ll and admire your nature. Lord knows I need some of your skills sometimes! But I’m also fine with the fact that I’m more reserved and would rather just sit back and observe or stick with a small group of folks that I know really well. Or just simply be alone – I like myself, I think I’m pretty cool to hang around. I think it’s also worth noting that introverts can have extroverted tendencies. If you have that balance then that’s when some truly magical stuff happens. Get an introvert in their element and they will come alive. You just have to be patient and let them get comfortable in their own time/way. That’s it. So to all of my introverts out there, you definitely have a friend in me – I got your backs. You can have fulfilling lives and still be an introvert. You just have to know the right time and place to allow yourself to get outside of your own head every once in a while. Be proud and stand tall! Truly own who you are and forget what anyone else says. Because confidence will translate well in any personality type, and that’s something that people should see! This entry was posted in Random Thoughts by Traci Turner. Bookmark the permalink. Thanks for taking the time to reiterate and carefully explain the so called "artist personality." This is one of the best articles I have read lately on this topic. I will always remember that you have my back, in order to understand it better. As an adult who puts a lot of emphasis into his thoughts about artwork, I have to be careful not to criticize other personality types out of small-mindedness. Well, it's almost too late; I have already developed many false impressions of people, especially younger people. But for someone who is a mixture of both introversion and extroversion; ambiversion, I think it's called; working in a public environment is just one thing that has greatly increased my awareness of the world. Now, inclusion is what I think I really want in life – with the more exposure to art and music, and also the quality time spent with a compassionate peer group. That seems to stimulate the highly emotional side, and enhances my creative potential. I have always enjoyed trying new things, and from time to time, something will make a real impact. I have realized these days that one good time with someone is never enough. If I don't reach out for a while, I get worried and I fall back into a cycle where the pressure is put on me to be more social or whatever. So I'm told that I really have to work on that. However, this is very encouraging to read. It's something that will build character. Again, thank you for articulating how are you dealing with things lately.